The distance between Taipei, Taiwan and Allen, Kentucky is approximately 7,825 miles - nearly three times the width of the continental United States. That figure doesn't cover the sizable amount of time the trip actually takes, or the massive culture shock one experiences upon migrating from one far out location to the other. Yet in his two years at Allen's Wesley Christian School, Benson Lin has made that journey look like a walk in the park. Only two natives of Taiwan have ever played NCAA D1 basketball on scholarship. Jeff Wu of Sacramento State became the first in 2015, followed by Ray Chen of Liberty this season. Lin is only a high school junior, but he is determined to join their ranks once he completes his high school career. The son of a mother who played professionally and a father who played and coached, Lin was destined to be a basketball player. When discussing Lin's skill set, Wesley Christian head coach Dave Meddings, it's apparent his unique background played a role in his development. The phrase "basketball IQ" comes up almost every other sentence. Lin's knowledge of the game and uncanny ability to see the floor is proof that the "coach's kid" stereotype knows no borders. 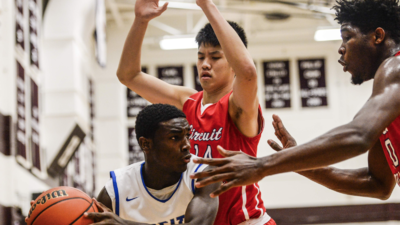 While attending a Nike Elite camp in his native Taiwan two summers ago, a connection between coaches put him in contact with Wesley Christian's staff. "There's a door opening, and Benson's one of the ones kicking down the door, so to speak," Meddings explains. "When the door falls...there's a lot of basketball talent in Taiwan and a lot of [Taiwanese players] are trying to grab hold of the dream of coming to America and playing." Benson is one of six Taiwanese players involved in the program at Wesley Christian and one of two on the roster of Wesley Christian's national-level team. Lin's success on the US prep circuit and the international level has led to a considerable number of young Taiwanese players to seek out a similar path - right down to their desire to follow in Lin's footsteps at Wesley Christian. Coach Meddings regularly receives correspondence from prospective Taiwanese student-athletes who are interested in enrolling at the school. And why wouldn't a young basketball player from Taiwan want to walk down the same path? As Coach Meddings pointed out, Lin is playing his high school ball at a higher level than any of the players from Taiwan who came before him. Over the course of a national schedule for Wesley Christian, Lin is averaging 16.1ppg, 4.0spg, and shooting 46.7% from long range, all while maintaining a 3:1 assist-to-turnover ratio. Lin has shown plenty of moxie in the bigger games on Wesley Christian's schedule. He scored 17 points and had 6 steals against Mount Zion Prep and went off for an eye-popping 29 points on 6-for-8 shooting from beyond the arc against national powerhouse Huntington Prep. "Benson was excited [and] he was up for the challenge," Meddings says of the latter performance. "None of [his six made three pointers] were just open, we didn't really run a lot of stuff to try and get him those threes...[we] ran a couple plays, but he hit a couple of step-back threes, he was just feeling it." Lin's shooting is one of his defining attributes as a player. Lin's work ethic comes up very often in conversation with Meddings. Meddings has a favorite anecdote to frame Lin's workhorse mentality. "The only time Benson Lin has gotten in trouble [with] me, the head coach, is the day I asked him to take a day off and he disobeyed me and got in the gym," he admits with a chuckle. "I'm not griping about that. If that's the only problem I have out of a kid, that's a good thing. But I tried to explain to him, his body needed a day off, and he struggles with taking days off. He actually came out the next night, I think he put up 24, so he kind of proved me wrong." Lin also received a boost from a unique opportunity this past summer. At the FIBA U-17 World Championships, Lin was one of the leaders on the Taiwanese squad. Lin scored 16 points in Taiwan's contest against the USA, matching up against Duke commit Gary Trent, Jr. and consensus 5-star 2017 prospect Kevin Knox. Competing at such a high level is a significant accomplishment in its own right, but Lin revealed that he saw his international stint first and foremost as a way to gain valuable experience going against some of the top players in his age group. As a result, that confidence has followed him back to Wesley Christian this year. "He's not scared of anything," Meddings replied when asked if Lin's time with the Taiwanese national team had affected his game. "Every matchup we go into, he's looking to prove he's the best player on the court...that probably comes from playing against Team USA. He approaches each game the same way, it doesn't matter if we're playing one of the lower-level teams on our schedule, or we're playing Sunrise Christian or Huntington Prep...The 'no fear' is great quality to have and not a lot of kids his age have it. It's really helped us in a lot of big games." Concering the next level, Lin is fairly straight forward in describing his goal. "I want to play at a high-level program." Expanding on this, Meddings cites Lin's potentially historic status. "He wants to be the first high-major Taiwanese player," Meddings explained. "Even Jeremy Lin [who is of Taiwanese descent], he was at Harvard, that's a mid-major, [Wu and Chen] are at mid majors. [Benson] wants to be 'that guy.'" Academics are also mentioned as a factor, as Meddings highlighted Lin's strong performance in the classroom. Location isn't much of an issue. "No matter where he goes in our country," Meddings said wryly, "he's thousands of miles from home." Lin's recruiting process is still in its early stages. He will have numerous opportunities to gain offers and interest from schools during spring AAU ball and the summer showcase circuit. Lin has already begun taking unofficial visits to some high-major programs. He has been up to see West Virginia three times and was in Knoxville for Tennessee's tilt against Arkansas on January 3rd. Lin was quick to identify the facilities and the coaching staff as the two aspects of Tennessee's program that jumped out at him most while on his visit. "It was exciting for us to go down there and exciting for Benson to talk to the coaches and see a high-major program," reflected Meddings. "Benson really enjoyed his visit." Yet despite all of the attention Lin's play garners him, his levelheadedness still jumps out at anyone who sits down and talks with him. When asked about any goals he has for the rest of the season, Lin's response was simple. "My goal is just to try and do my best and help my team win." 7,825 miles may seem like a vast distance, but Benson Lin shows that having the right attitude transcends all boundaries. Sam Shapiro is a contributor for Verbal Commits. Sam was raised on a steady diet of UConn Huskies basketball games, which developed his deep appreciation for the game of college basketball as a whole. Currently a junior at New York University, Sam is excited to be a part of the Verbal Commits team and create top-quality content for his fellow recruiting enthusiasts.